Hail and well met to our Brethren and Sistren in Focused Flight! 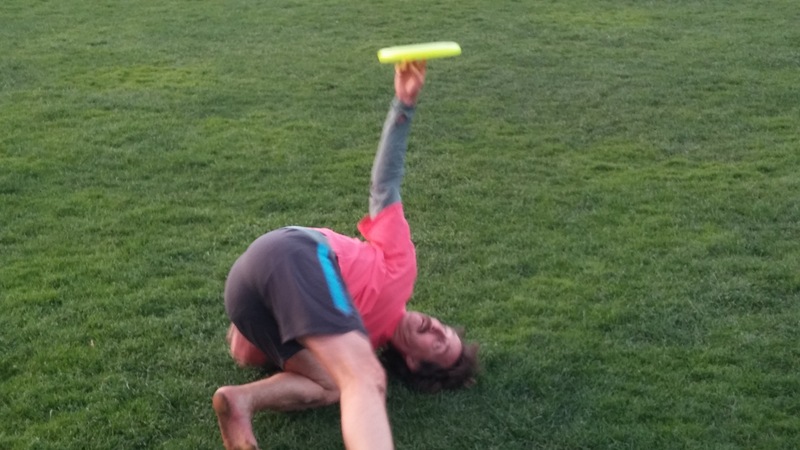 After being Yella consecutive weeks while working on a video to help get sponsors for the 2016 Worlds, your intrepid reporter returned to the Meadow getting the Early Earl with not one, but two Guest Jammers. I was so thrilled by all of the Jams that I neglected take attendance nor any notes. What can a Designated Scribe to do in such circumstances? TedShred sporting the 2nd Gen Yella Jersey, which was retired shortly thereafter. On a sun-filled September 17th in the year of 2015, we were graced with not just one World Champion but two full-on shredding World Freestyle Champions in the form of the incomparable Jonathan “Honey Smooth” Willett, and the human spinning top formerly known as “Toddy Bro.” It is Jammers of this caliber that keep A*T (Doug E.) Fresh and on the upswing after twelve outstanding seasons. 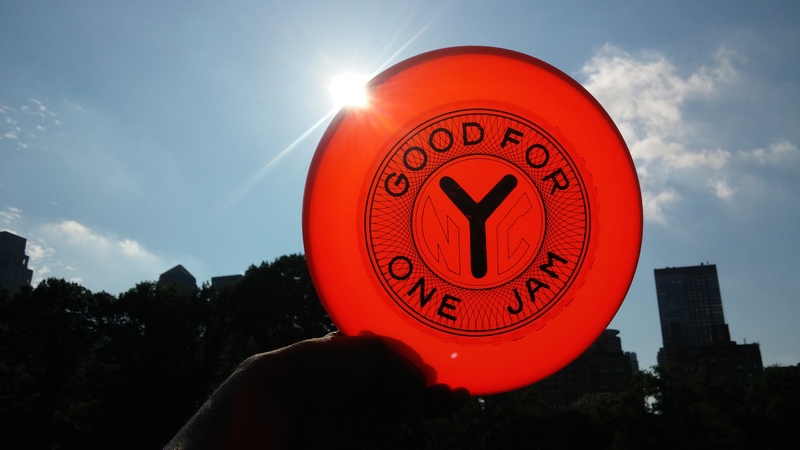 The Jam of the Week evolved in many intertwined permutations from the initial grouping of (not so) Young James, Ted Shred, Doug E. Fresh, and Toddy Bro, mixed liberally with some JonaHEIN and just a dash of our own Guardian of the Discus, Daniel O’Neill. This one came out of the gates at a breakneck pace and only increased in intensity as the slick wore away. On a scale of One to Ten, I would dare to say this mixture of Crusty Old Schoolers–accompanied by the shiniest new models the sport has to offer–Took it to Eleven! Not only that, but we kept the accelerator floored until the Margaritas came a flowing. So what did it take for this crazed cohort to take it to this higher level? To answer this question I defer the thoughts of Skippy Jammer, who after being flown in by The Tribe described his own post-All*Star Thursday euphoria as akin to “having the Village Vanguard as your personal jazz club, with the A*T crew as the greatest house band in the world. Guests sit in on our sessions to Jam, and it’s all about the players and the improvisational jams they share. The end result, Skippy noted, has redefined freestyle play. 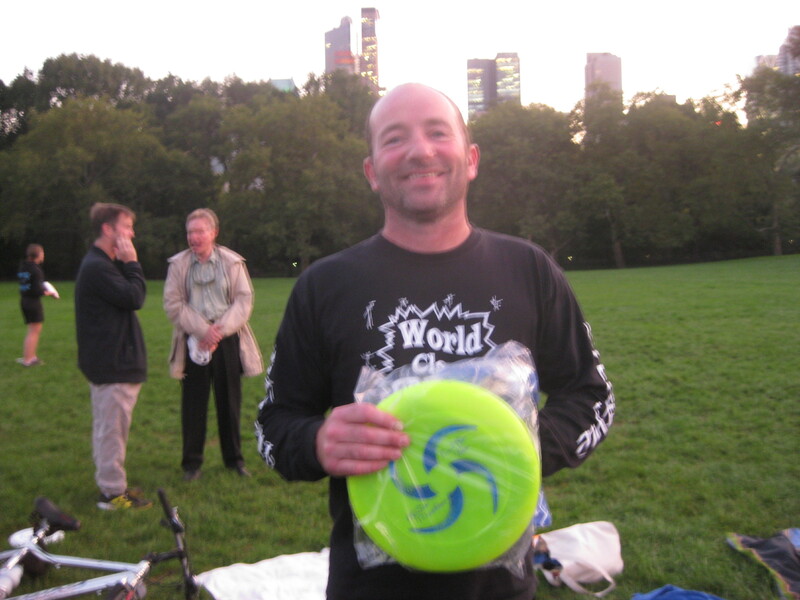 Toddy Brodeur In da’ Meadow back in 2011 receiving his A*T Guest Jammer package. Within the same sequence two different players rolling it from the back of the right hand down their back and off the heel of the left foot, only to be corralled and seized by a full on brushing posse 30 yards into the wind, followed by a crosswind chest roll into a spinning Flying Gitis snatched by the same Toddy Bro right hand that initiated the first back roll. Do ya want more? How about, back-to-back planted spinning Gitosis seals after two consecutive All-In 5-man O’Malachy co-ops! Your favorite Jam Band awaits you! 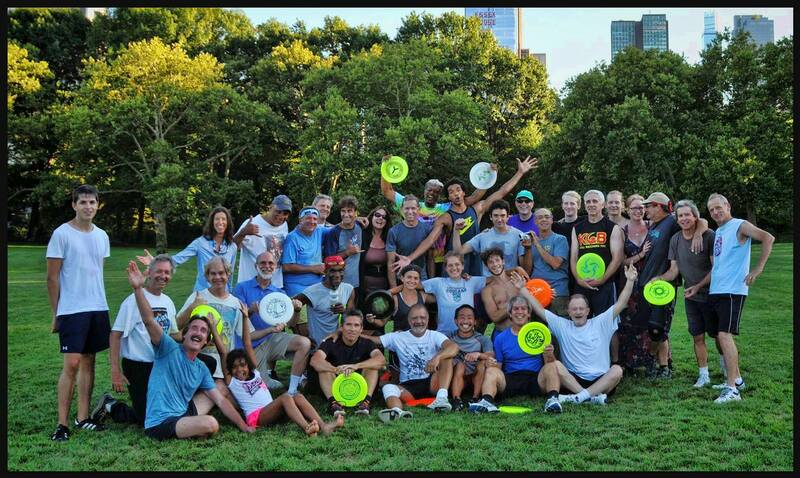 The Invisible String’s International Big Throw–Look close and see who You Know!!! So, when are YOU Comin’ Down?! 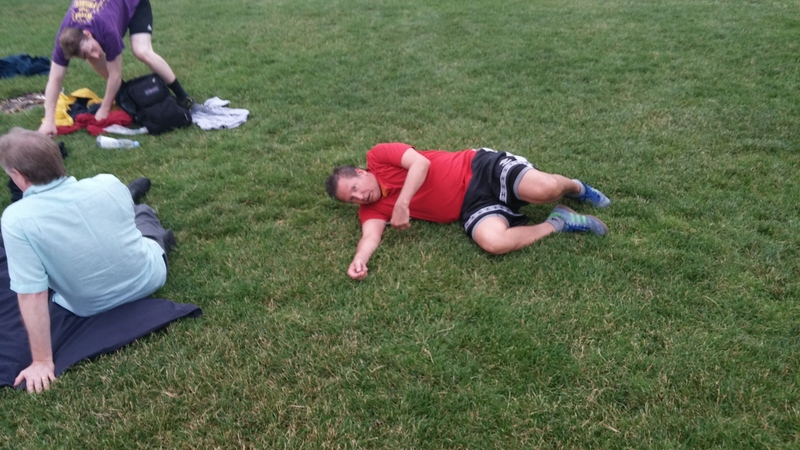 Life has been a whirlwind during the 2015 All*Star Thursday season. Your intrepid reporter has been silent for a variety of reasons, some good and others less than that. Yet we have had many causes for celebration, especially in the context of an incredible run of Fun and Frolic for The Tribe. 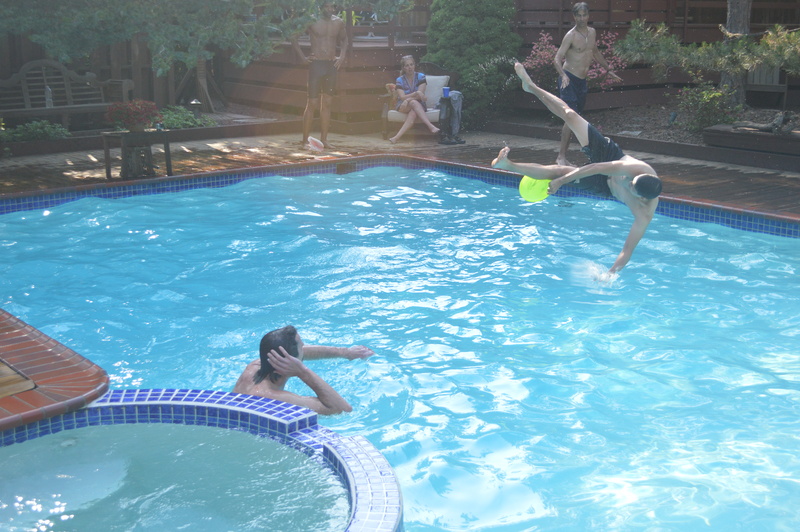 At Chateau Oberhaus, Most Fun ALWAYS Wins! And so much Shredful Behavior on the Meadow and at the Bandshell that “WOW” is simply the best way to describe it. The Reliable One, Quinn-O, LOOOOOOOUUUUU & the Lady Johanna, Chris Kohn, JB, The Guardian of the Discus (aka Daniel O), JB, Alex, Ben Heaver, Jaime-TJH, Kevin, Bradford T., Yuval, Benedicte, Emily, Ivan-TJH, Gerry “Circus” Lynas, TedShred & TLC, Robbie-Rob, Jens Velasquez, Chuck, Doug E. Fresh, The Ageless Trevor Brown, Dave Bickerman, Mike Heaver and his daughter Simone, Rick Williams, Alan C. (again!!!! ), Mike Tallon (an Old School Heaving Brother) and Sir James of Wiseman. And a few more folks whose names my three functional neurons refuse to fire upon. And the Jams…OH MY, THE JAMS! At one point there were three 5-person Mob-Ops and one featuring 6 Jammers going at the same time. One of the more spectacular combinations featured Larebs, Ryan, James, TedShred, and Doug E. Fresh where the Flow was akin to a Might River, and the Seals tighter than a drum. 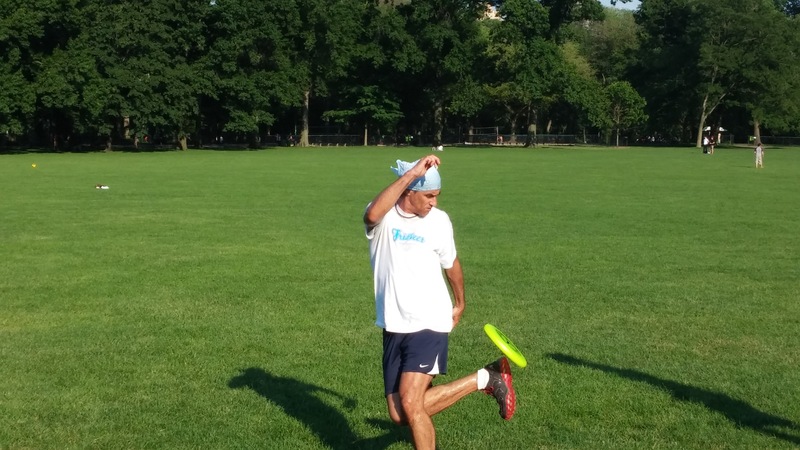 Early on, Rick W. grabbed me for a warm-up Jam that started with three minutes of dropless play, the disc hit the ground once (My Bad) and then went another five minutes before hitting the ground again. The Jammin’ Heavers later got into the act when Ivan-TJH, Jaime-TJH, Ben Heaver and me went out and had a Jam session at 60+ Yards. At one point Ivan moseyed in my direction wanting to Jam. I said “You can’t go out on a The, you have to hit a Gitis first.” Jaime launched, Ivan leaped and sealed an Imposso-Gitis, saying “Like This? !” and it was off to the Land of the Slicked Disc! Later I was lucky enough to get Laerbs, TedShred, Alan C. and Ivan, with another featuring Jens and Ryan. There were many, many others that I missed because I was busy playing, but suffice to say that this A*T entered the Land of Legend instantly. Later that evening Roger and Tricia graciously opened Chez Meier for the After Jam Party, and on Saturday TedShred and The Lovely Chrissy hosted another gather of The Tribe at the Chateau Oberhaus. Again, the Jams were beyond imagination, including back to back Gitosis pulled of by Sir Shred and (the formerly Young) James; Laerbs hitting his 5th and 6th post-hip surgery Gitis’ (Gitii? ); Ryan playing at an incredibly high level all friggin’ day long; the Next Gen Jammers (Yuval, Benedicte, Emily) CRUSHING; and Ivan upping the Most Fun Wins quotient to stratospheric levels by bringing a water balloon gadget that fills about twenty at a time. Where is that dang disc? When are YOU Comin’ Down?????? We’re in the third week of April, the Virginia States are behind us, and Winter has thus far refused our request to exit to points far to the North* (well beyond Boston). It was so chilly that today’s entry was almost the “A*TC: Call 4 Conditions Edition.” But we are a hearty bunch, and while there were some complaints, we had a fine turnout. 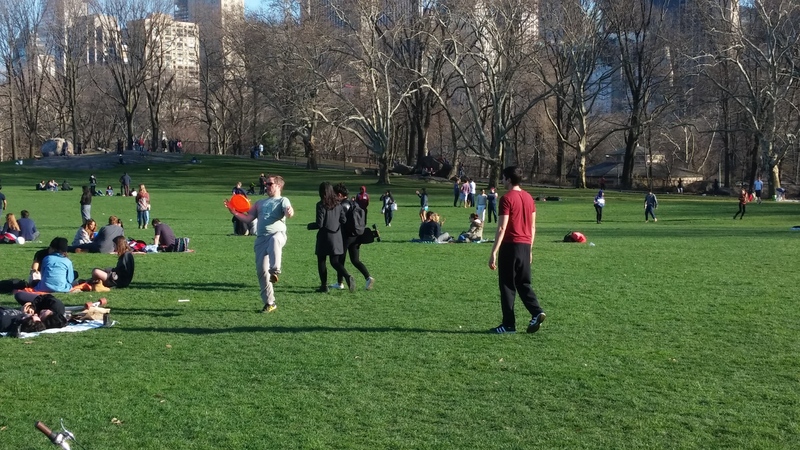 When I arrived, Robbie-Rob and Ivan-TJH were already Jamming furiously on a virtually empty Meadow. Truth be told, the Board had been considering awarding the first Yella Jersey of the season to Mr. Fried given his very thin record of attendance, but his Shredful Behavior has put that issue to rest. The two of these gentlemen were doin’ it, and doin’ it, and doin’ it well. Rob utilized his echo-location to great advantage, nailing a Double Spinning Scarecrow seal off of his signature spinning behind the head brush, while Ivan continues to amaze with his backhand brushes with both spins and hitting Gitis off of impossible sets. This was a fresh blood kind of day for us because Ivan’s sister Felicia came down from Bahston area with “The Nephs” (aka nephews) and ventured out with his consort, the Exquisite Erica. To observe the love of this family hanging out together on our Green Beach warmed my heart…if not the rest of my body. The Hard Corps of the Big Apple!!!! 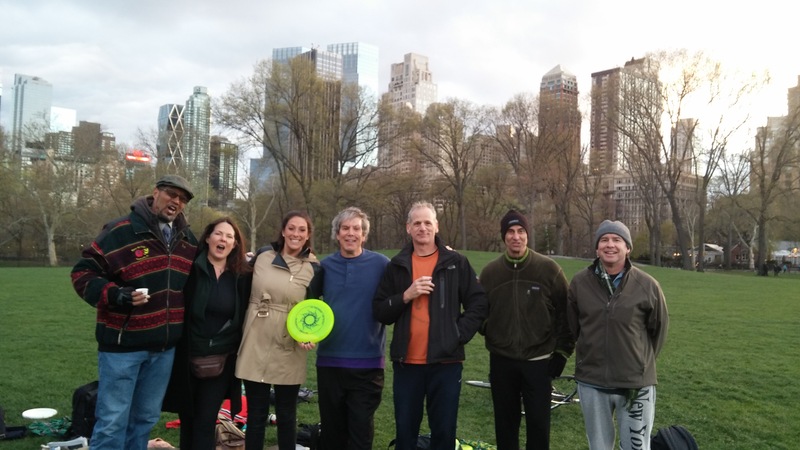 As time moved on, we were joined by Quinn-O, Bradford T., Roger The Reliable, TedShred and The Lovely Chrissy, Claire Heaver, and the newest member of The Tribe, Heather Wooten. 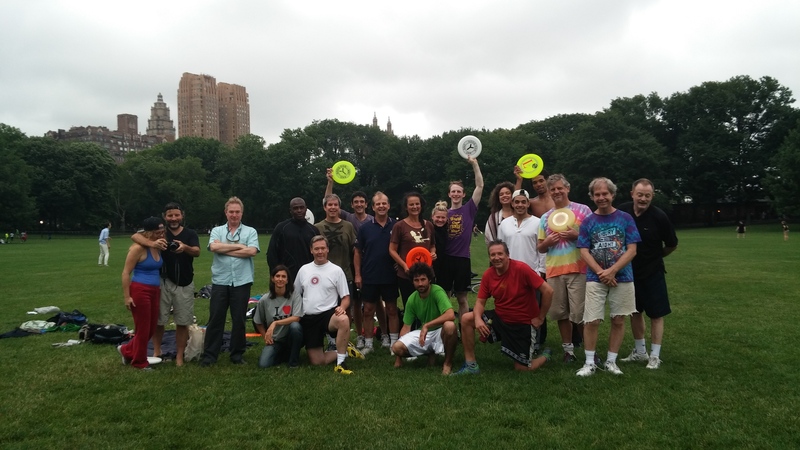 The latter is a 2nd Generation Frisbee player, scion of the Wooten clan–not the Wu Tang Clan, as far as I know—and she was welcomed with an A*T Gift Pack, including a set of specially carved and monogrammed nails created by TedShred himself. S’Nice! The Jamming was Mob Op Stylee for the most part, with me, Quinn-O, TedShred, Ivan-TJH, and Roger goin’ at it for a pretty long stretch before The Reliable One broke off to Do a Duet with Bradford T. Jam of the Day honors go to Sir Shred and Ivan-TJH, who kept playing long after everyone else had shifted our attention to Tasty Agave-Based Beverages. And what a Jam it was! 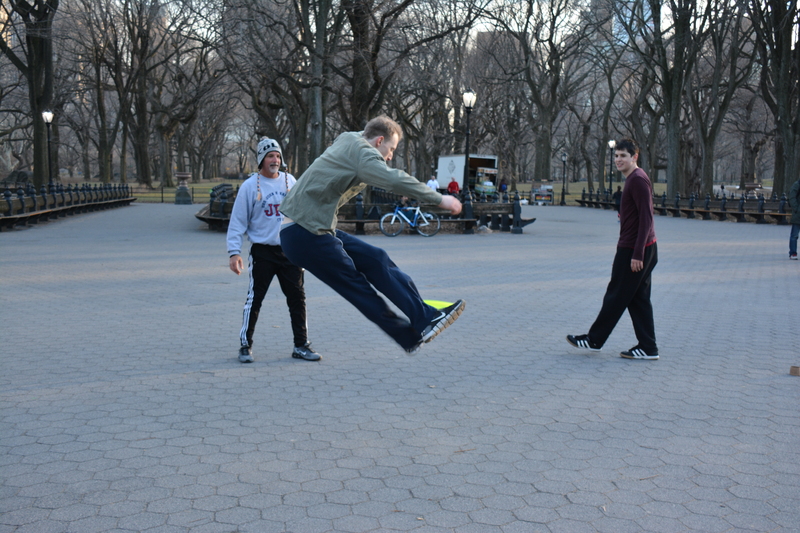 Every single Jammer should make the pilgrimage to NYC just to play with Mr. Oberhaus, who plays barefoot in the cold with an unmatched combination of skill, passion, and joy. And Ivan? He may well be the most coordinated person I have ever met. My favorite element of his game is when he does everything “wrong” and yet still winds up making the impossible play The Only Option. Man, is this stuff fun! Mr. Dan O’Connor is hosting the Circles on Sounds Frisbee Festival on Saturday, May 9th in Bridgeport, CT. The cognoscenti know that this is the original home of the Frisby Pie Company, and our buddy has put together a day filled with Frisbee Frolicking (Remember kids: 3 Prances = 1 Frolic) and a bunch of us are heading up to join the fun. When are YOU Comin’ Down??!! First, a big shout out to Lazslo’s Wienie World and the entire crew that pulled off the 39th Annual Virgina States. I was able to catch some of the action via UStream (Thanks Jake!) and via YouTube (not sure who shot it, different angle). The NYC contingent was small, but The Tribe was well represented by TedShred and The Lovely Chrissy, James the Wise Man, and Fearless Loooooooou. Looking to join in and being a part of a large turnout for the 40th! It has been a bit quiet on the written communications front, but there has been plenty o’ fun. We have had uneven weather for our All*Star Thursday gatherings with a couple being moved to the Bandshell, but given that we don’t need any stinkin’ conditions, that has been fine. While it was not on a Thursday, we did have a couple of true Masters of the Sport come by earlier this month: Krae Van Sickle and Bruce Page! Bruce and James displaying Shredful Behavior. That day was special on multiple levels. First, Fearless Lou and I were punchin’ the clock in our lil’ Jam. 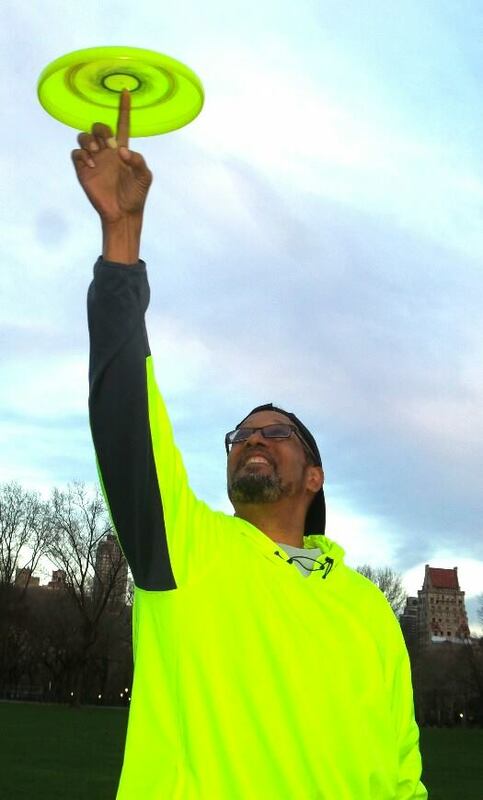 It was a nice day and we were just loosening up when I hear a voice say “Mind if I bust this Jam?” and there was Bruce, a great Jammer and a better person. The three of us played for a while and then suddenly there was Krae(?!) saying hello. This rare sighting was enough to get James to put down his books for a while, making a mad dash to the Meadow to get him some Vintage Jammination. The Mob Op was lots of fun, with much passing and more smiles. Both Krae and Bruce were great to play with, though my favorite moment came when James did an insane combination, going from standard to UD and back, then finishing with a Double Spinning Gitosis seal. Krae just shook his head and chuckled as if to say “These Kids Today.” Of course, Mr. Van Sickle pulled a couple of items from his bag of tricks in return and a good time was had by all. So this coming week is notable because a special invitation was issued by TedShred and TLC while they were in Virginia. Jens Velasquez will be joining us, as will Ms. Heather Wooten (daughter of Eric) for some Plastic Play. Woo Hoo! The unrelenting Winter of 2015 piled an obscene amount of snow on the eastern half of the country, and that made Jamming difficult. But once the clocks changed, that meant we had enough daylight to “Do that Voodoo that We Do So Well!” And so, the second Thursday of Daylight Savings Time brought out a crew of legendary proportions. Pre-Season 2015: The Gang’s All Here! 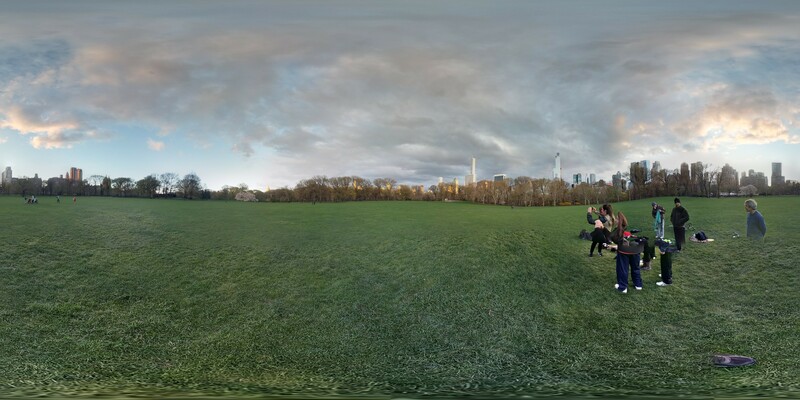 I knew something unique was happening as I strolled through Strawberry Fields on my way to the Bandshell and was approached by a Busker/Poet. She shared a few nice verses on creativity and pursuing opportunity that made me smile, and put me in the right frame of mind for Jamming. Cheryl Kenny and her Beloved were coming into town to check out a David Byrne Tribute Concert at Carnegie Hall, Sue Strait was in NYC to do some research in her chosen field of academic pursuit, and both scheduled their trips around (All*Star) Thursday. Cool Beans already, but there was more to come. ‘Zackly what I should have been thinking. We started with a Mob-Op, which was the operative word of the day. PK, James, Daniel, LOOOOUUUU, Emma, TedShred, and me. This was unbelievable, especially at this time of year. 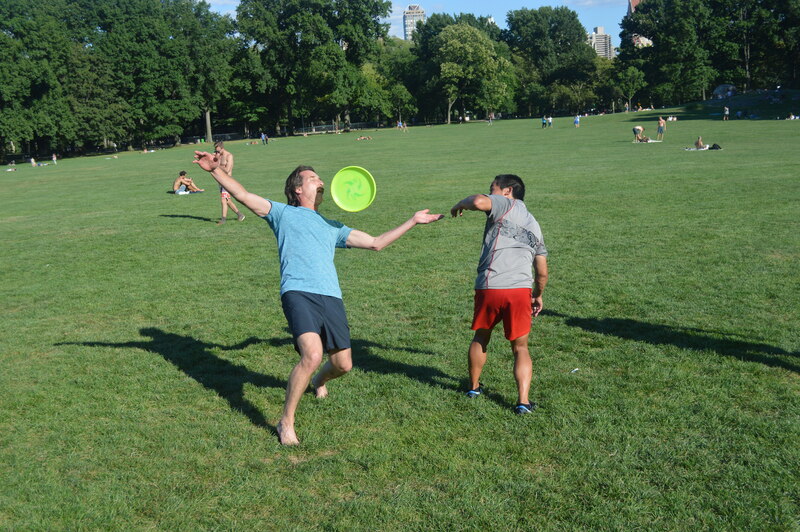 There was much fancy passing and transcendent sealing, with everybody getting their chance at the disc. 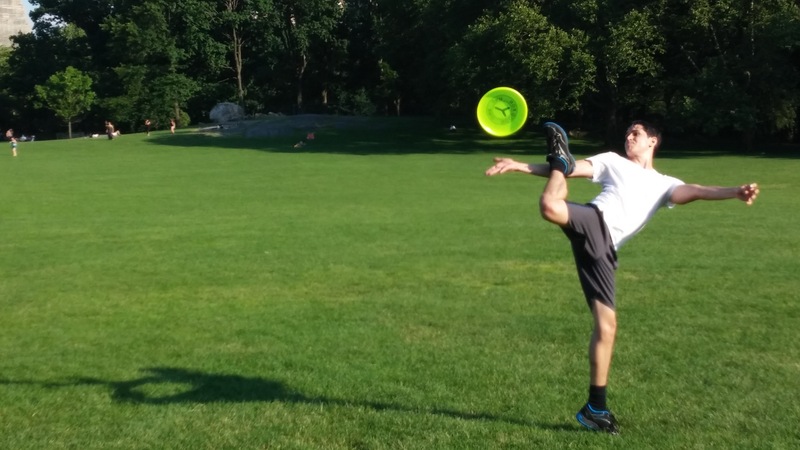 PK is a brilliant orchestrator, knowing exactly when and where to pass the disc, or if it is time to crush a Scarecrow and start with a new throw. 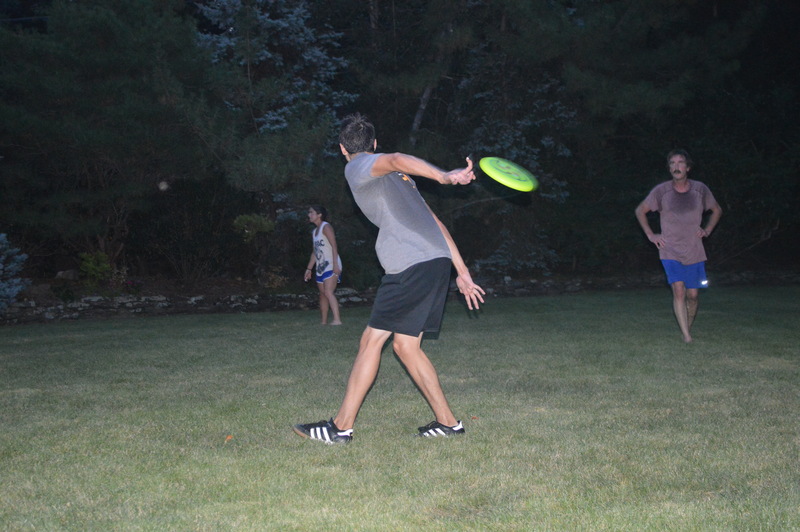 Daniel has added elements of self-assured physicality to his game through his training with Pilobolus, Emma still has “Big Dog Inside”, and James has developed a sense of touch that allows him to manipulate the disc in ways that defy the laws of physics. Lou has been in the lab too, chomping new catches and heckling with abandon. All that plus TedShred?! Oh Man, this was just great! At some point Daniel broke off to Jam with Robbie-Rob, and PK went to join them too. I could not see too much of that one since I was in my own Jam, though I did see Rob hit a Teabag set to Double Spinning Gitis seal which was Very Nice. 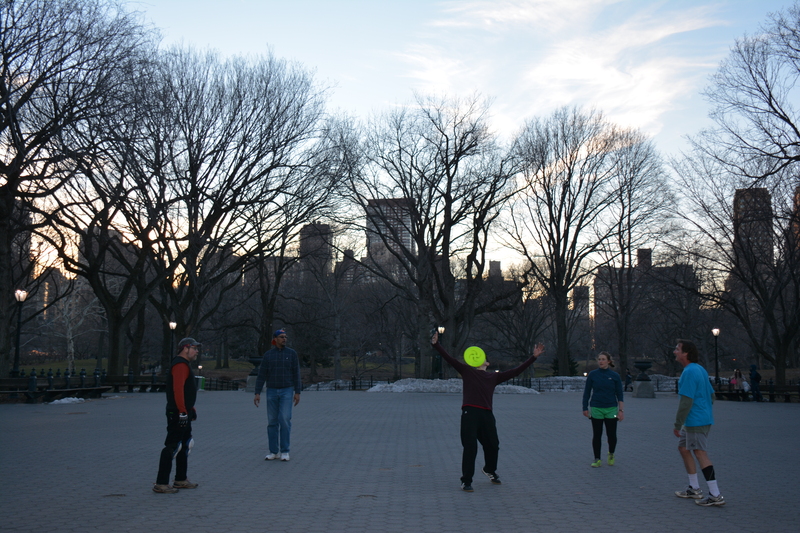 The Jams continued with mixing and matching players, and we were joined by The Reliable Roger, Kevin, Jaime-TJH, Quinn-O, and Doug E. Fresh as the sun began descending in the sky. 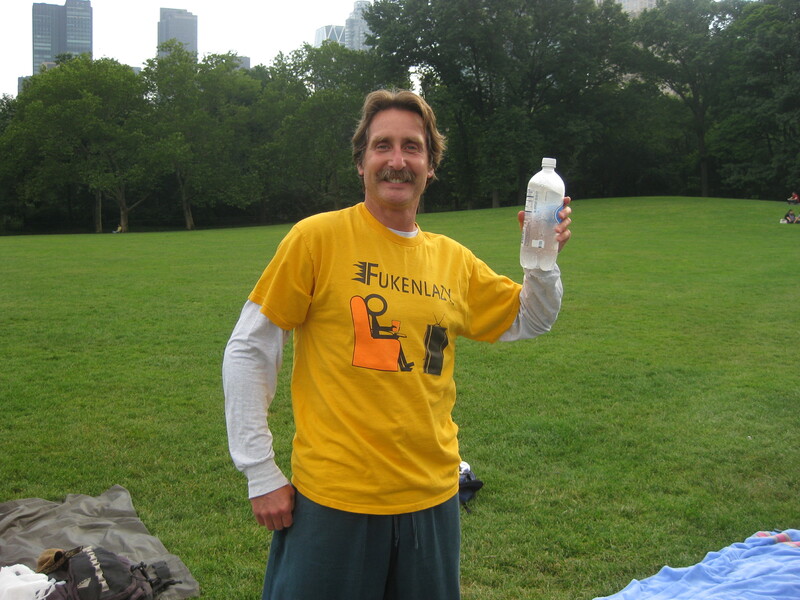 Mr. Fresh has a newly installed bionic ankle so he is not playing just yet, but he is stepping up his game as our Heckler-in-Chief until he heals completely. 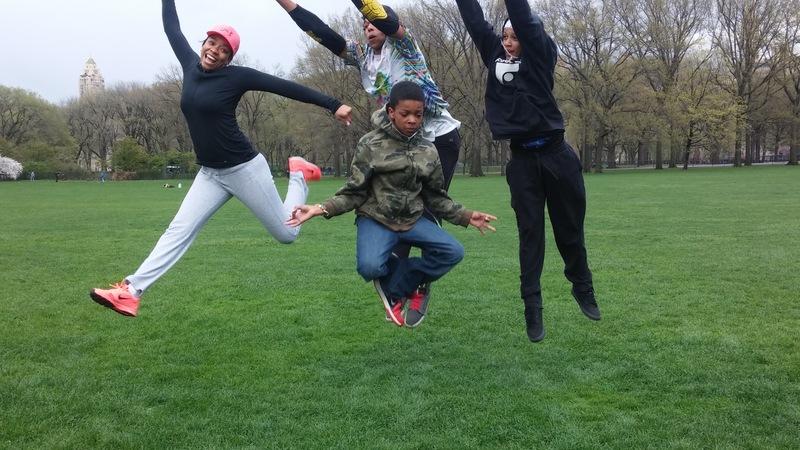 The chill in the air simply inspired the Hard Corps of the Big Apple to play on. The Last Jam featured James, Emma, TedShred, me, and LOOOOUUUU. As the rest of the crew chose to head out to Malachy’s for post-Jam beverages, we just kept on playing until the sun went down. What a GREAT Way to start the 2015 All*Star Thursday Pre-Season! Last Jam Goes to 11!!!! P.S. Saturday’s Jams featured most of the above along with Ivan-TJH. 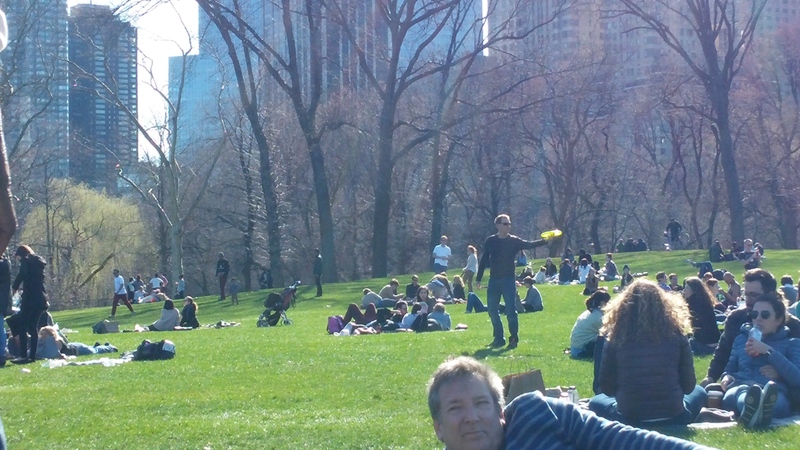 We are so lucky here in NYC. Thursdays have always been cool because (as the day before Friday) they signified the beginning of the weekend for most folks. Then in the Spring of 2004, a new tradition was born in the form of All*Star Thursdays. The backstory can be found here, thanks to Tommy Leitner. 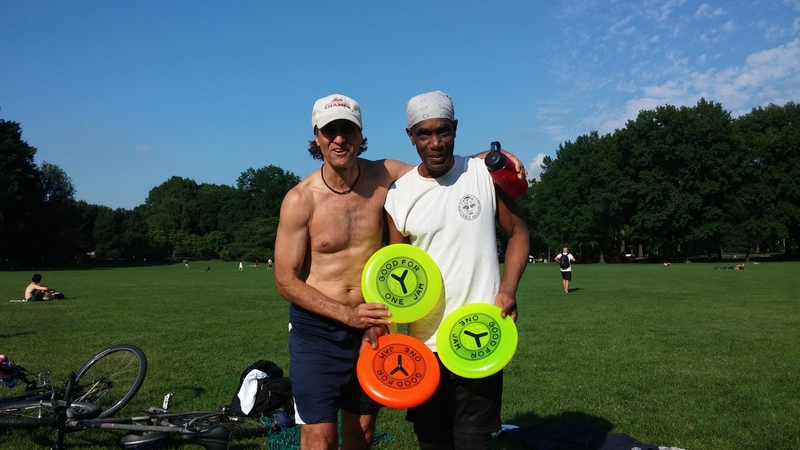 Ten years, countless hours of Shredful Behavior, and a veritable galaxy of international (All) Stars later, we are now an institution in the Freestyle Frisbee community. Well, no need for concern–time to Jam. Rob and James got up first, and this was very special. 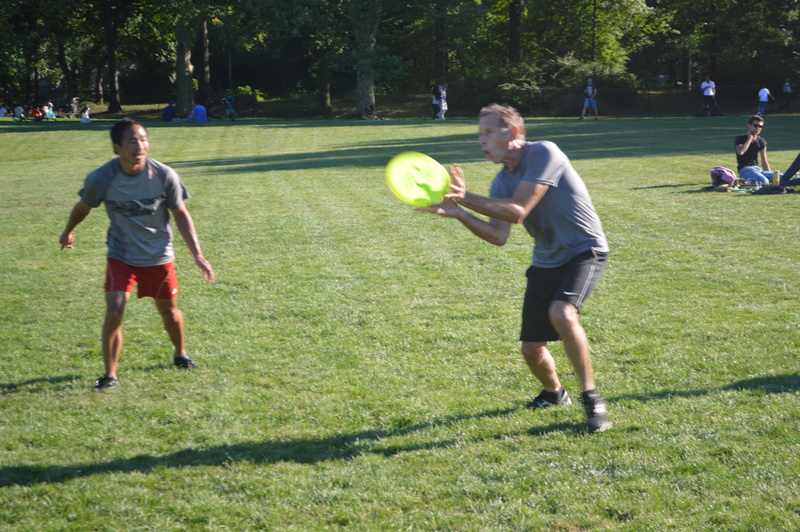 James earned his FPA #1 ranking in tournament play, but it is in our Land of Jam that his training began and Robbie-Rob has been one of his many master instructors. And let me say that these two were really a sight to behold. Rob’s tips, MACs, guides, and incredible sets to Gitis remain among the best in the game. And James? The cat has transformed into a Monster, making moves that border on incomprehensible. WOW! Stylish! And he flattened it out with that heel tap…Amazing!!!! But that was the furthest thing from my mind as I strolled over the water fountain to fill my bottle. I was just focused on getting back to the Jam when I heard a voice saying, “Oh, you ain’t leaving just yet!” And there were TedShred and The Lovely Chrissy, joining us for the first time for an All*Star Thursday in 2014. In truth, I was really overwhelmed with love and respect for these two dear friends. There are few people as relentlessly positive and generous as TedShred, and The Lovely Chrissy is his perfect complement. The complexities of life kept them from joining us until the Almost Solstice A*T, but that just made it that much sweeter to see them. Once they said their hellos, James and I snatched up Sir Shred’s first Jam, and it was GREAT! 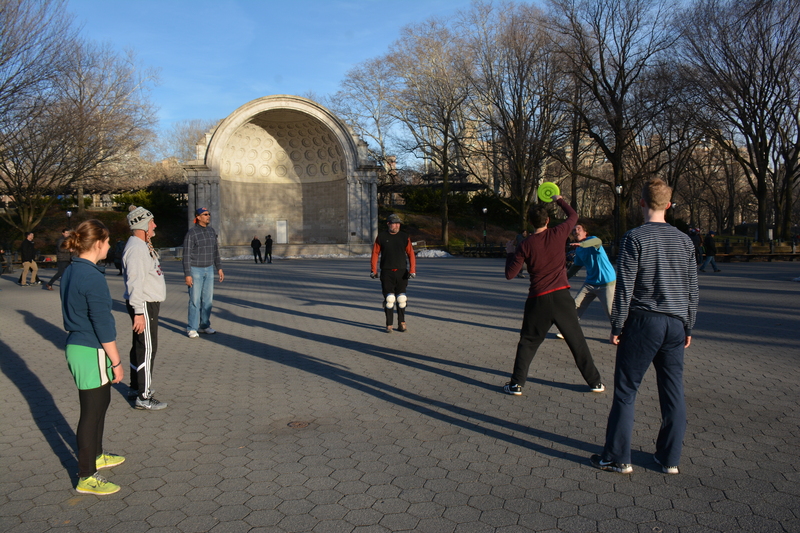 Our Flow came on in a rush, and the level of play was high with long stretches Droplessness. James was on fire and Sir Tedley played as if possessed by the Spirit of the Jam. About ten minutes in I said to both, “Man, I fell like the luckiest guy in the world right now. I am playing with two of my long lost Brothers on an All*Star Thursday!” Both looked at me for a moment and smiled briefly. Then Ted said, “Yeah…Less talk, more Jam!” And away we went, with Ted hitting a Gitosis and James going berserk. Man, that was fun! When James broke for water, TATB came in seamlessly. That was a wild moment because their respective styles are very different, but the collective Flow remained constant. Things kind of blurred from that moment forward, with a number of folks rotating in and out of the Jam until we were escorted off of our Green Beach by the Parkies at dusk. It truly does not get better than this. The Hard Corps of the Big Apple! Unless of course YOU decide that YOU ARE COMIN’ DOWN!!!! P.S. 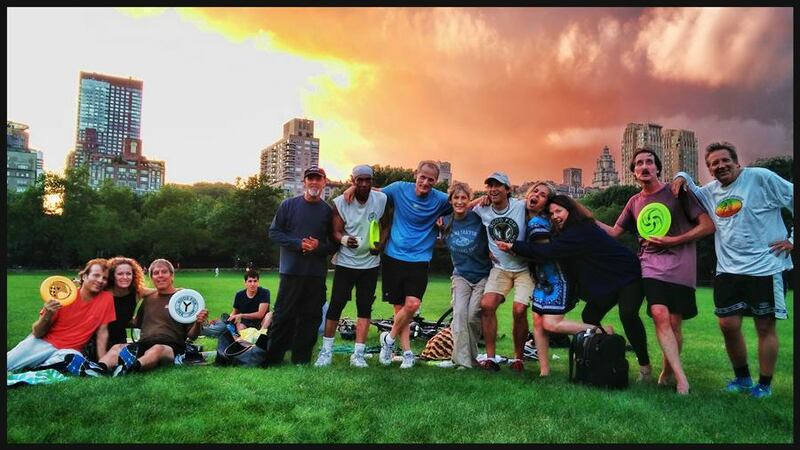 A few weeks back George Bodarky of #WFUV #Cityscape came down to record a segment for a show called Summer in the City. 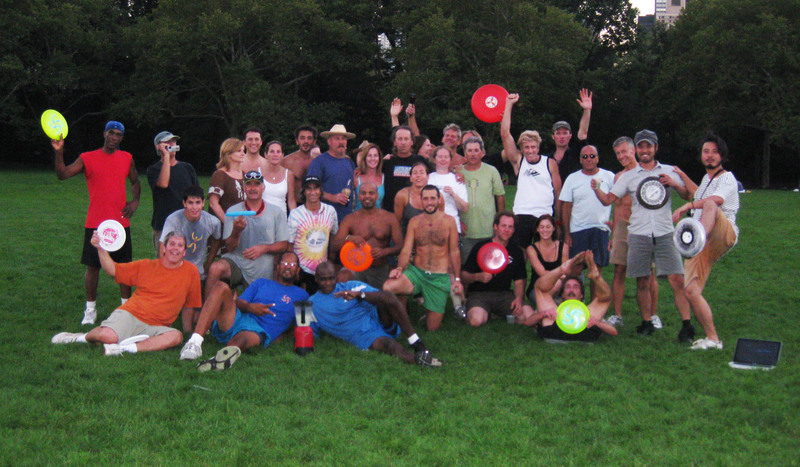 Go to approximately 14:20 for a feature on Freestyle Frisbee and All*Star Thursdays. SPREAD THE JAM! 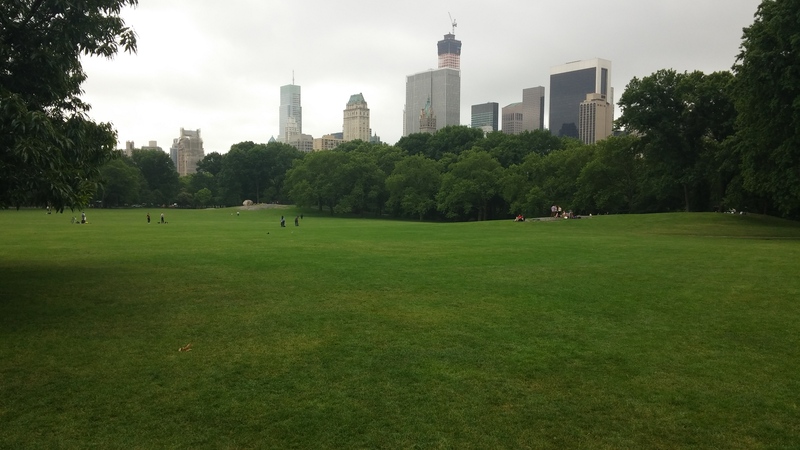 Clouds and high humidity greeted me as I entered a virtually empty Meadow from the Northwest corner. While it was not a pretty day, the conditions (which we don’t need) were really excellent. And who might be on hand for the early shift Jam? Why, it was Sir Steady Flow, Daniel O’Neill, and the Lovely Lady Bethany who was in NYC on biz, and she wisely scheduled time to join us for an All*Star Thursday. This pair had already broken a sweat as they prepared a routine for a certain tournament taking place in Medellin this summer, so we chatted a bit while I nailed up. 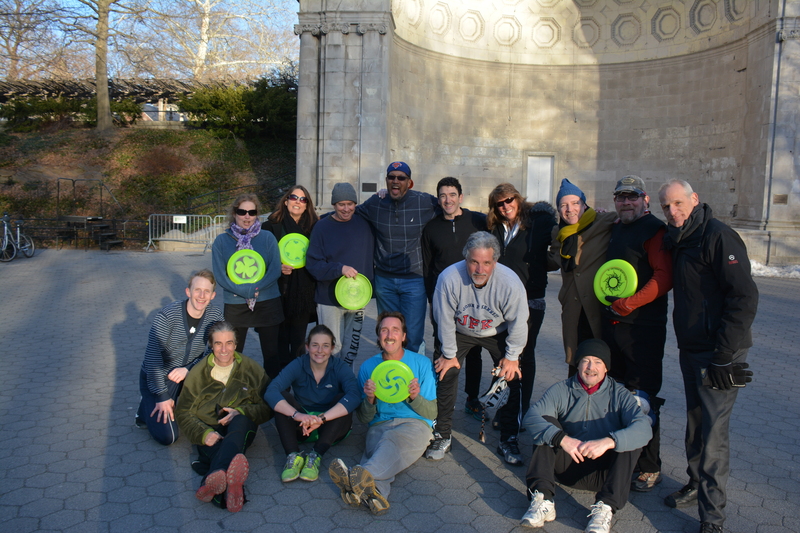 Not wanting to waste any time, we got up to play knowing that there were a number of folks likely to join the fray, including an appearance of Freestyle Legend Kerry Kollmar! Also on hand were Jaime-TJH, Ivan-TJH and his Beloved, Mojito Jay, Kerry’s Lovely Lady Paige, Bradford T., Dexter and Lucia (Guest Jammers for two weeks straight! 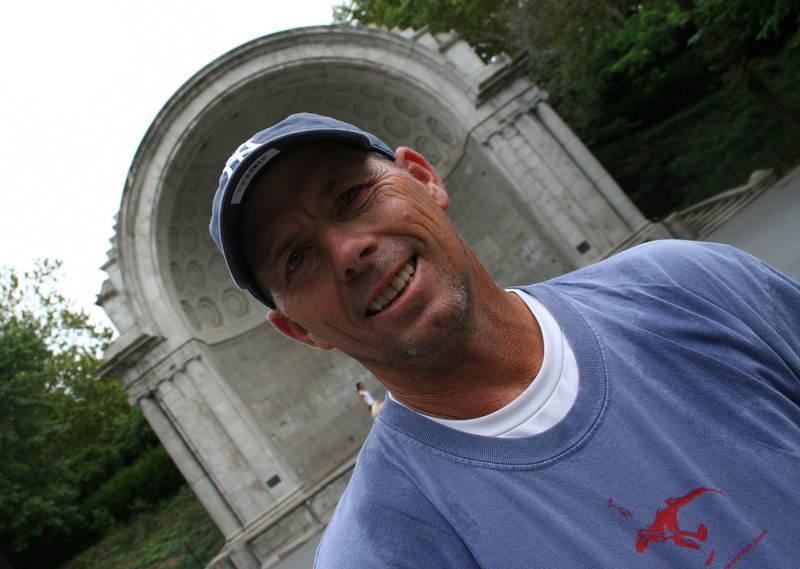 ), Fresh, Keith Heaver and Adriana (congrats), Mark Dana, Chuck, Alex, Kevin, and a late arriving Roger. Our first Jam was marvelous and morphed into the Jam of the Day because this was the one that never really stopped. My orange Token disc got the full breaking-in treatment with folks rotating in and out from this early moment, until the end of the evening. Bethany is wonderful to play with. 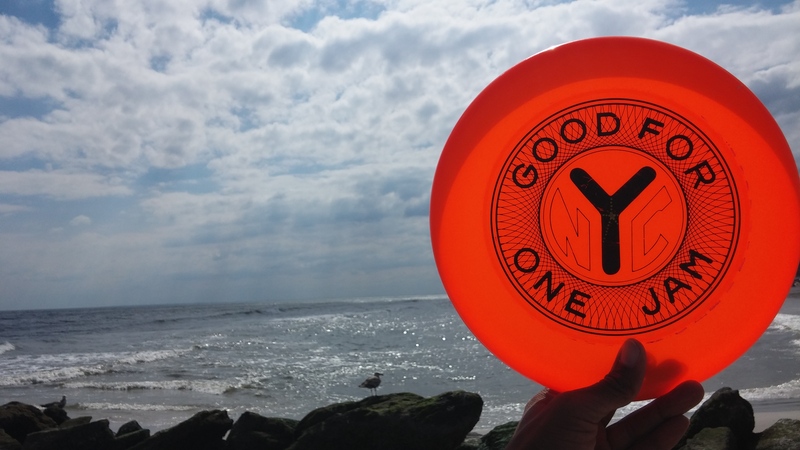 She is very smooth, throw strikes, shares the disc, and seals with great aplomb. And Daniel is playing with such grace and supreme technical prowess that Magic is likely to happen at almost any moment. We were really getting into it when Dexter hopped in, adding his tremendous motor and great footwork to the mix. We hit consecutive O’Malleys and then an O’Malachy (twice around the circle with no delays). Daniel stepped out for water and to greet his friend (Gus? ), but there was no need to fear as Ivan-TJH subbed in, barely missing a serious Levitation Gitis on his first play. Brad and Kerry got into a very nice Old School Jam, with lots of quick catches and cool stuff. This got Daniel’s attention, so he slid into that one seamlessly. 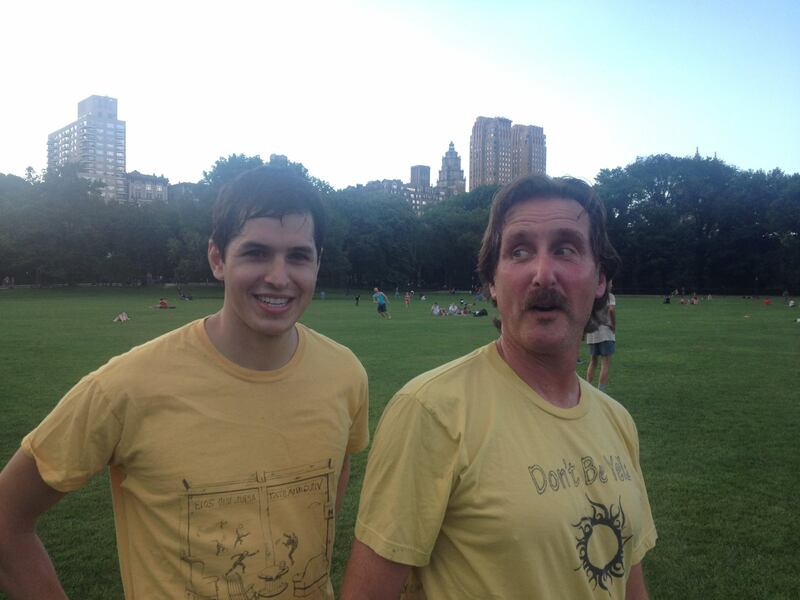 For myself, I broke away from my Jam for some hydration and got into a Mighty Heave with Jaime-TJH. As always, this was a BLAST! The Accurists have really been locking in and Shredding at distance, with Jaime hitting all kinds of combos with that 175, and nailing a Gitis to boot! When we wrapped that one up, Jaime got up with Chuck and Kevin and he later finished his Jam with a CHOMP of a Scarecrow after a sweet combo. Myself, Ivan-TJH, and Keith Heaver got into a new 3-disc game called “Simultanaeity” that Keith created, which was very cool. 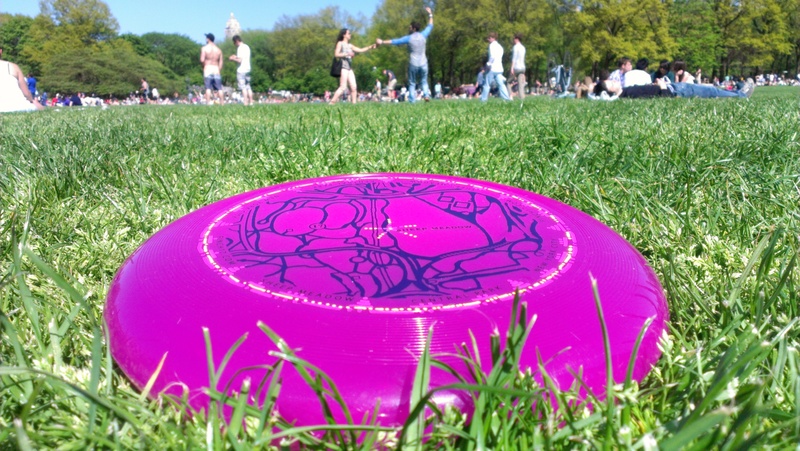 Starting with three different color discs, it is essentially three independent games of catch among the same three people. Hard to explain and wonderfully challenging to play. Newlyweds laughing at some guy with a large wingspan. Oh, and on the (pro)creation front, Keith just announced that he and his new bride are expecting their first child. Congrats to them both! I stopped to watch as Fresh, Ivan, Daniel, and Dexter just Went OFF! This one went to 11 on multiple occasions and the Flow was ridiculous. When Mr. Fresh hit the deck, having been Jammed into the ground by three sets of young legs (documented), I jumped back in. At some point Roger brought his Juju to the table, and we all had a real good time heading into the evening. Malachy’s was up next for some food as well as malt and barley based beverages. Oh, and then there was a lovely Saturday at Long Beach with lousy wind, but great company. But that is another story. When are YOU comin’ down???!! !